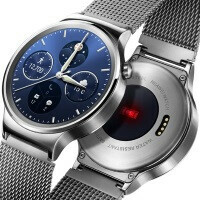 At IFA 2015, Huawei announced the US availability and pricing of the Huawei Watch, the company's first foray into the nascent Android Wear smartwatch market. Since its initial showcase at March's MWC, the wearable had been quite anticipated with its beautiful design and competent spec sheet, so if you are in the cheering crowd, you'll be excited to hear that the waiting's over. Well, almost! Judging by the watch's pricing options and design focus, Huawei is obviously after the types that would consider the Apple Watch. Rather than an elaborate wrist computer, the wearable is designed "first and foremost as a watch", opting for a round face, standard lugs, a 42mm diameter, and a physical crown mounted in the traditional "2 o'clock" position. The use of scratch resistant, double layer sapphire crystal and 316L cold-forged stainless steel contribute to the smartwatch's "premium" factor. The technological parts that make this watch smart are not to be underestimated, either. A 300mAh battery unit offers (on paper) two days of battery life with regular use, and charges to full in a manageable 75 minutes. The battery longevity is enabled, in part, by the 1.4-inch AMOLED screen of 400 x 400 pixels resolution and 286ppi pixel density, both the highest among smartwatches so far. There is also Wi-Fi and Bluetooth connectivity available, which means you'll be able to receive notifications even if the Bluetooth-paired smartphone is not in range. The watch features a heart rate monitor as well, supplied by "the world's most advanced manufacturer". The smartwatch is powered by the frugal Snapdragon 400 chip and features 512MB RAM memory with 4GB of storage. The Huawei Watch is up for pre-order on GetHuawei, the Google Store, Amazon and BestBuy. General availability and pre-order shipments will begin come September 17th. Stainless steel and black models are available for pre-order today, with rose gold models available later this year. Gorgeous, especially the black one. Good job, Huawei! Have to agree! Simply stunning! Now, what about IOS/WP functionality? Some features and sensors should be standardized. That way the watch becomes it's own product and not just a supplementary device to your Android or IOS handset. Now that's a nice looking watch. 1st Huawei smartwatch looks better than the 125th from Samsung. I wonder if the rumours about monkeys designing at Samsung are true..
Ha ha ha. You made my day. Why is there a problem to comment on the topic? Maybe I should comment about chicken or elephants here! This is my second fave looking watch but I think the gear S2 classic looks better. The one top right button/crown without a bottom button equalizing it or they should have put the button right in the middle and the thickness ruin it a bit. 2nd best looking smart watch by far though. Looks good, but the Samsung S2 Classic looks better. Now that's a nice looking round watch. No NFC = FAIL If the new Moto 360 does not have it either, Samsung will be getting my money with the S2 Classic. Doesn't matter how good it is because not many will want to spend that much on a Huawei.